Sorting out the 3 small yellow flowers of the Rose family, out at this time of year, with creeping runners and rounded petalled flowers, can be tricky at this time of year, so here they are. 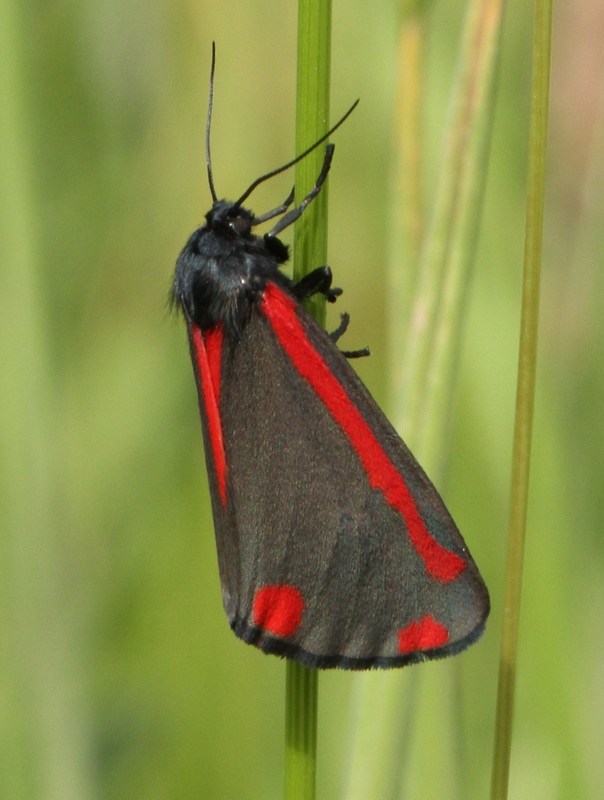 Tormentil is the smallest and grows very close to the ground in heathland, moorland and grassland. This one is the only one of the 3 with four petals. It has been used as a red dye and all 3 have been used in herbal medicine, as astringents and anti-diorrhea treatments, among other things. The roots of Tormentil are used in a bitter liqueur called Blutwurz, made in the Black Forest, The name is thought to derive from its use to ease tormenting gripes of the intestines. 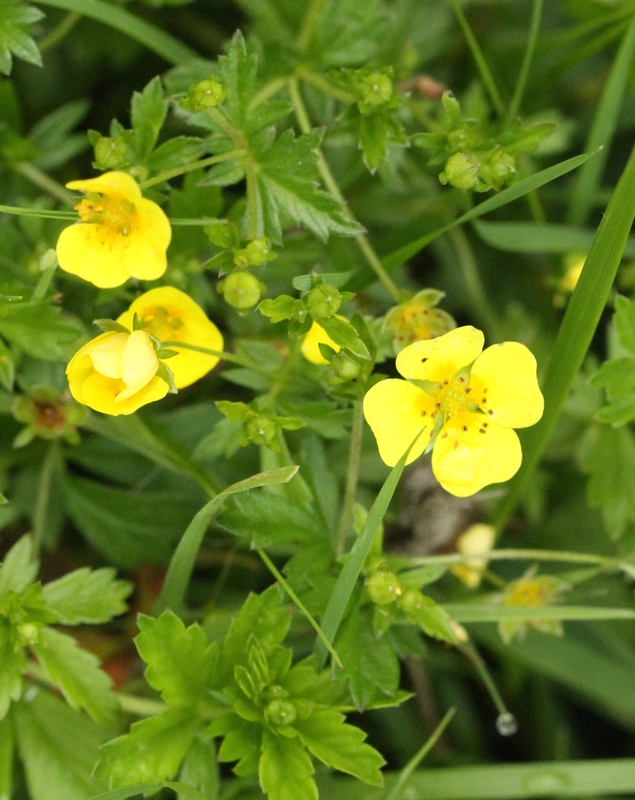 The next in size is Cinquefoil, from the Old French for five-leaved. 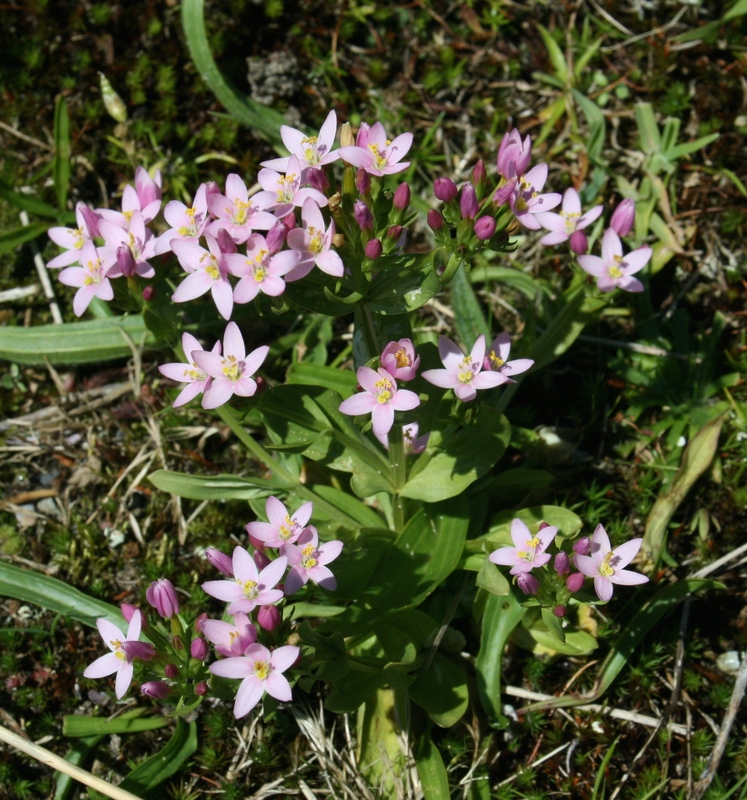 The flower has five petals . The Cinquefoil has been used extensively in herbal medicine, the five-fingered leaves thought to represent the five senses. They were also believed to scare off witches and evil forces! A decoction of the roots can be used to treat fevers, toothaches etc. 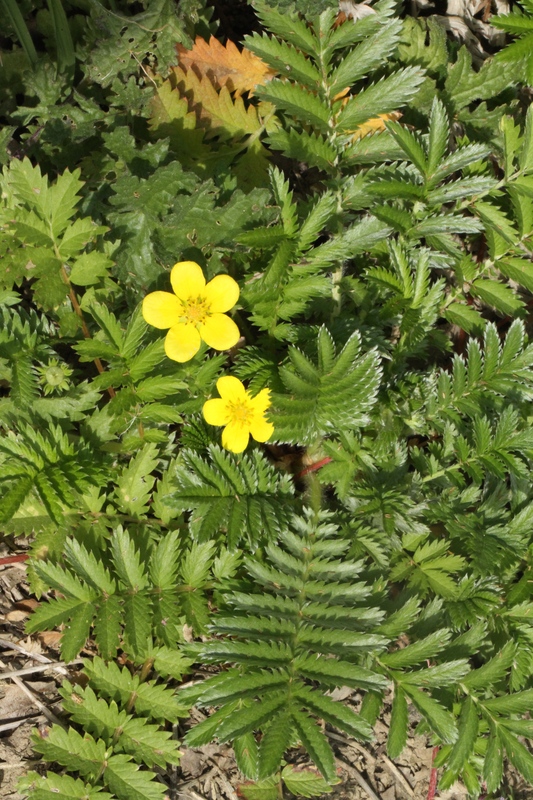 The largest of these creeping plants is the Silverweed and, though they have five-petalled flowers like the Cinquefoil they are easily distinguished by their long, fringed leaves which have either silver both sides or on the back. 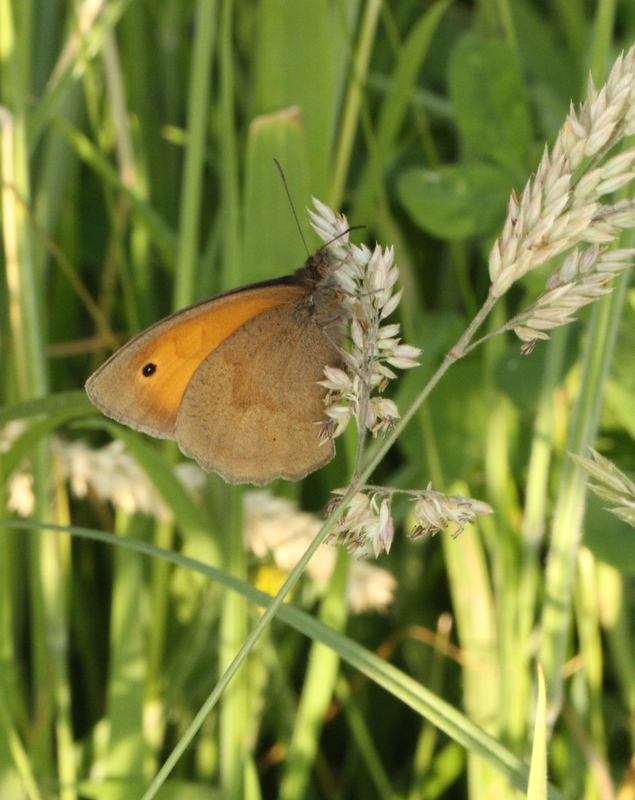 The Silverweed has beed cultivated as an edible pant for its roots, as well as being used for herbal treatments. Its leaves are very absorbent and they have been used in the shoes of people with very sweaty feet, to absorb the sweat! 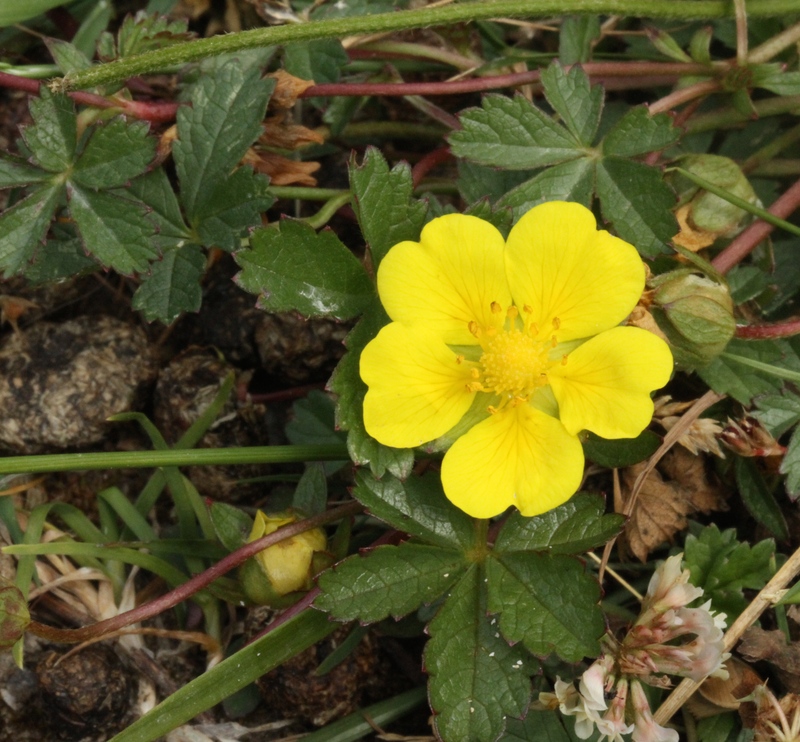 Cinquefoil, with five petalled flowers and five fingered leaves. Silverweed. 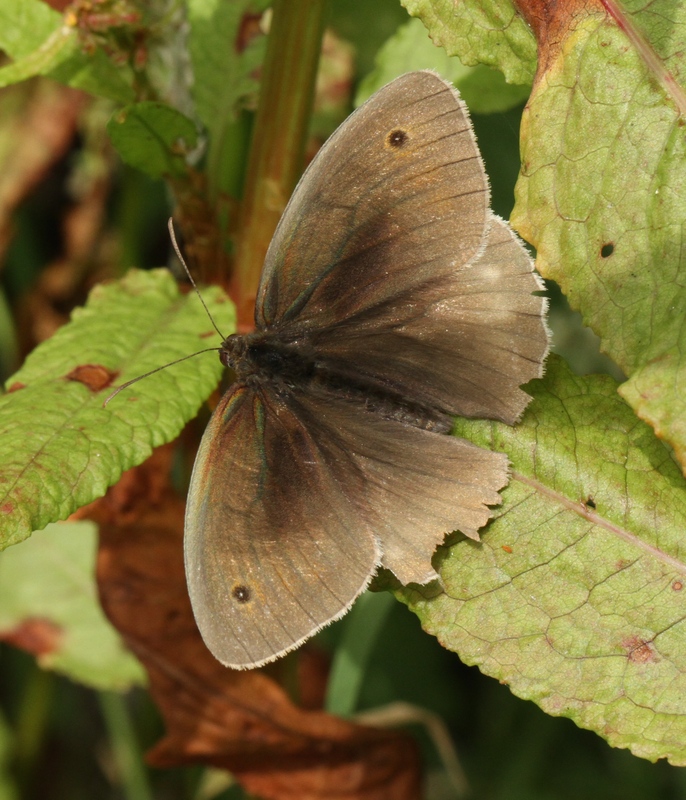 with five-petalled flowers and long leaves, always silver-backed and sometimes silver fronted. 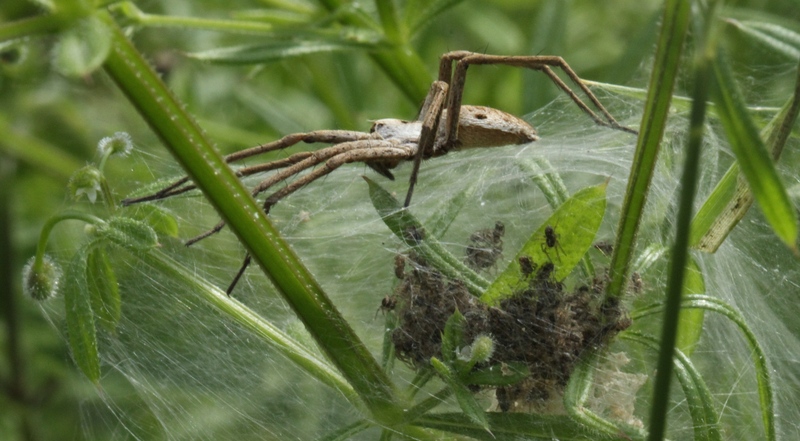 The Nursery Web Spider is much easier to see at present, because the female, which is grey, yellowish or brown, with a tapered, long body and a pale streak along the middle of its carapace, is guarding its wonderful Nursery Web. The male, generally darker, with a smaller abdomen, will have offered the female a ‘gift’ of a dead insect wrapped in silk, before pairing and mating On the earlier blog I did about a Nursery Web Spider the silk-bound parcel was visible.) Studies have shown that the bigger the gift, the longer mating will be and the higher the number of eggs laid and fertilised. 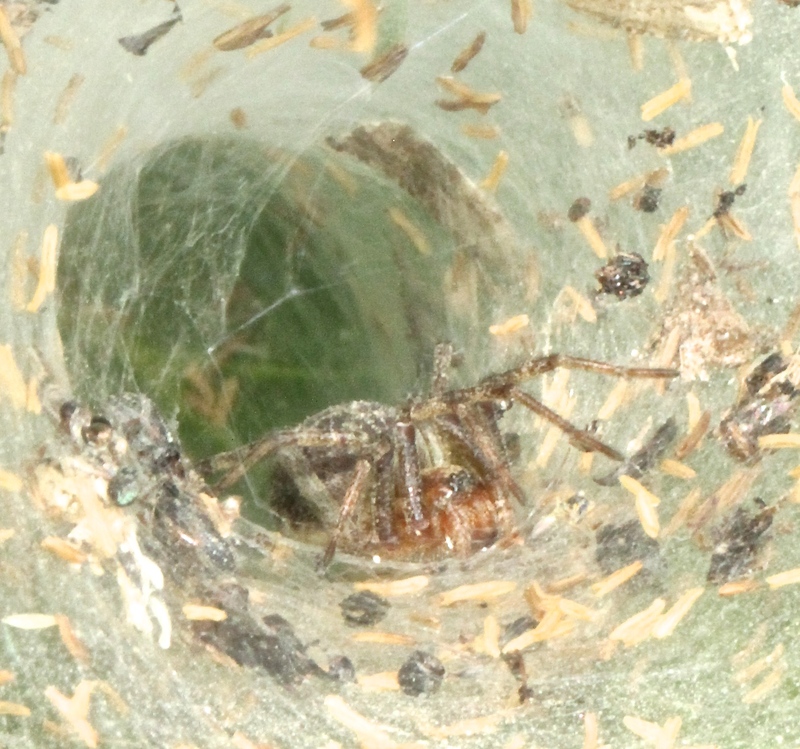 The female carries the large egg-sacs about under her fangs until they are about to hatch. 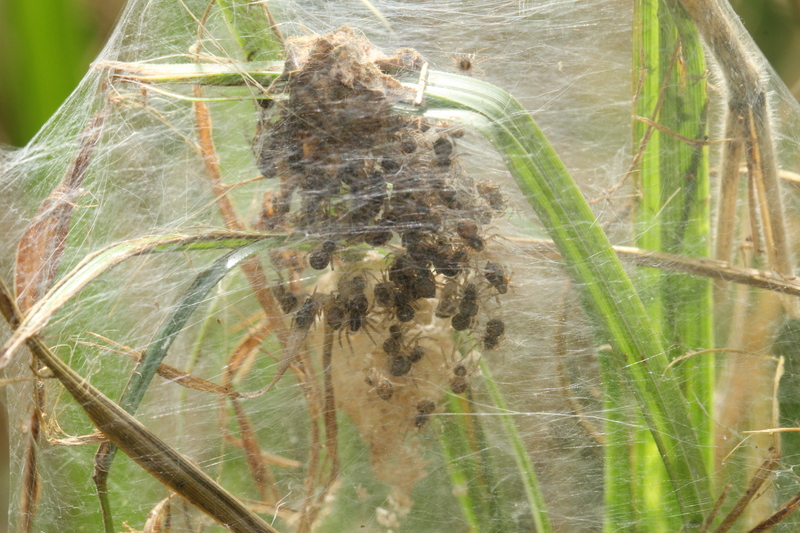 This is the point where she deposits the egg-sac on a leaf and spins the protective silk Nursery Web tent around the sac, before gently opening the sac for the spiderlings (they really are called that!) emerge. You can see hundreds inside the webs in the photos. 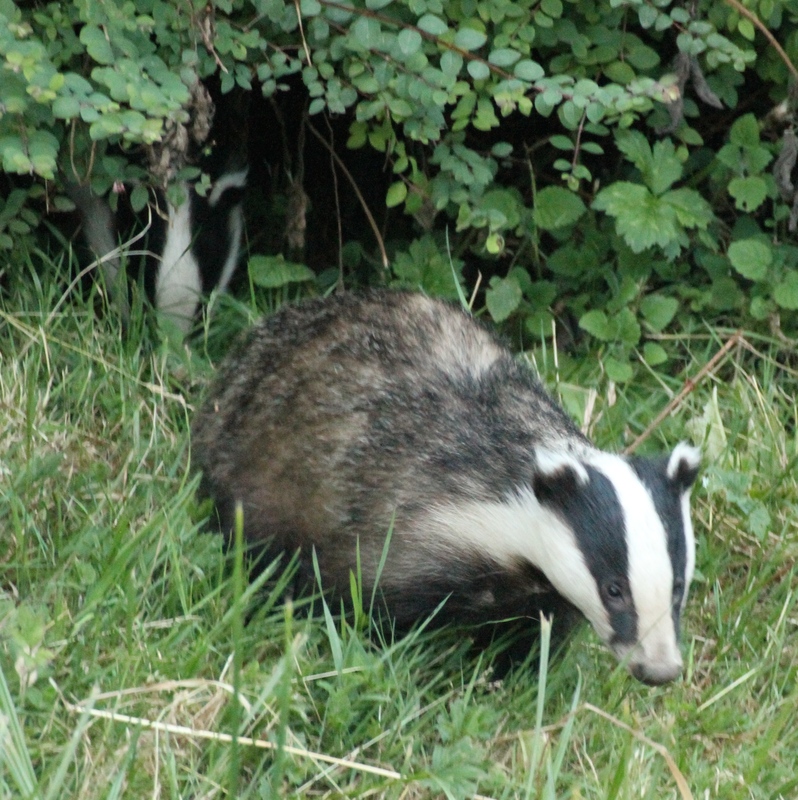 She stands guard until their first moult, when they emerge from the web and fend for themselves. 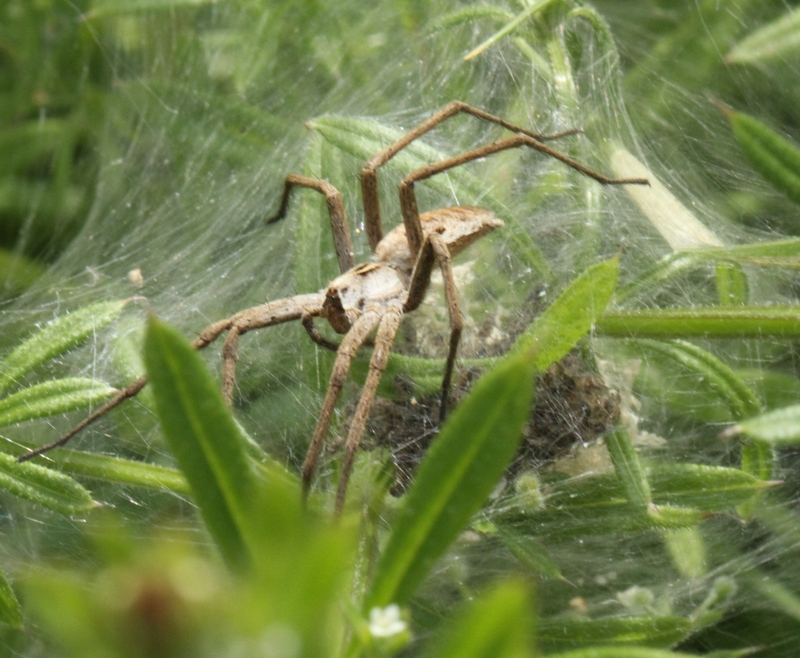 Nursery Web Spiders don’t spin a web for catching food. 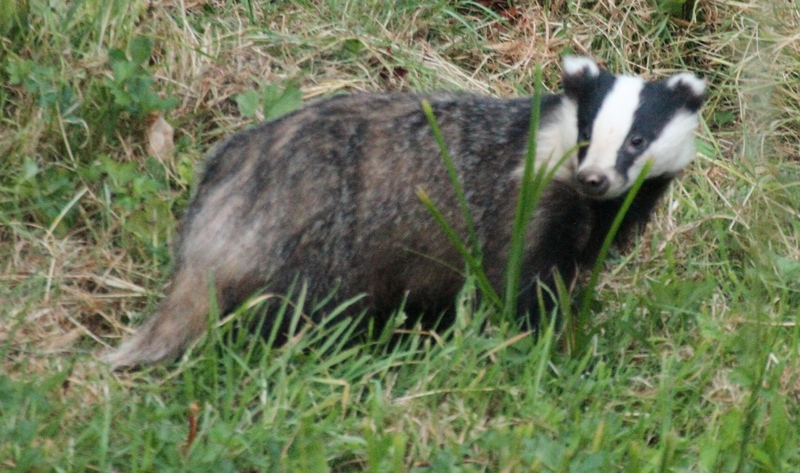 They have great vision and are superb hunters, basking in the sun on the top of brambles and or nettles until prey comes along and then pouncing with great accuracy! Conditions: In Sheffield – cloudy and cool. 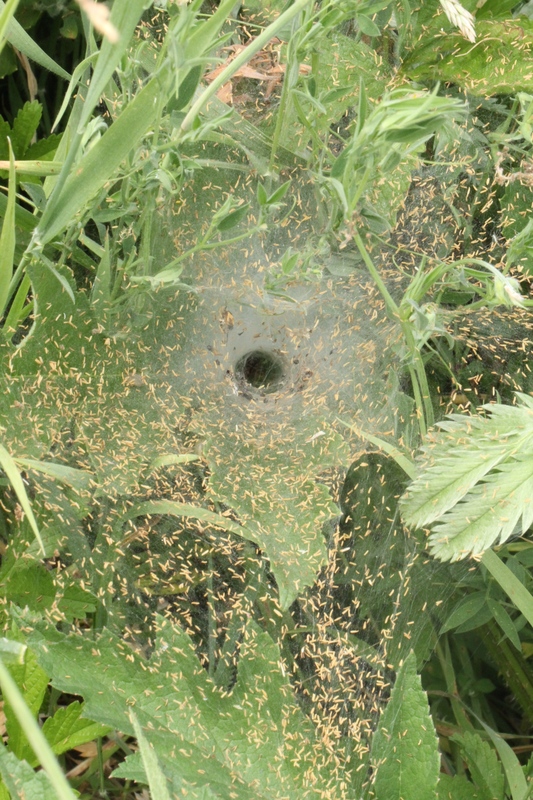 Temperature: Max 14- Min 10 C.
Nursery Web female guarding her spiderlings in the web-tent. go through what is called incomplete metamorphosis, in that they go from egg, to larva, to adult phase, without the pupal stage. 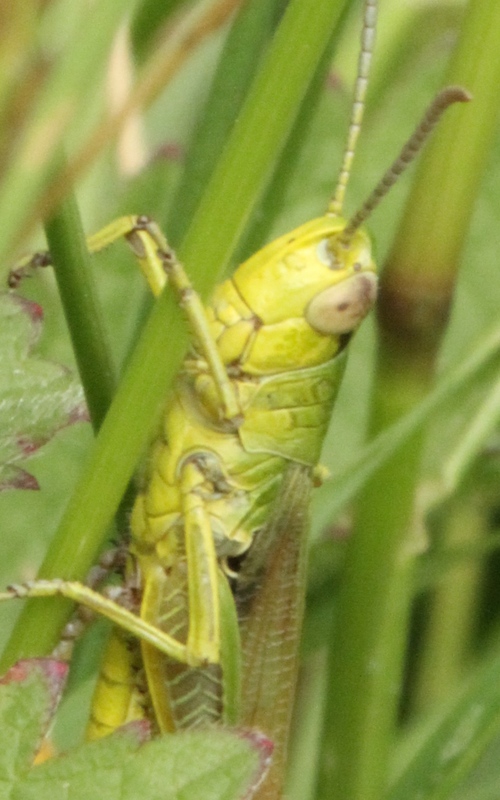 Eggs are laid just under the ground and hatch in spring. 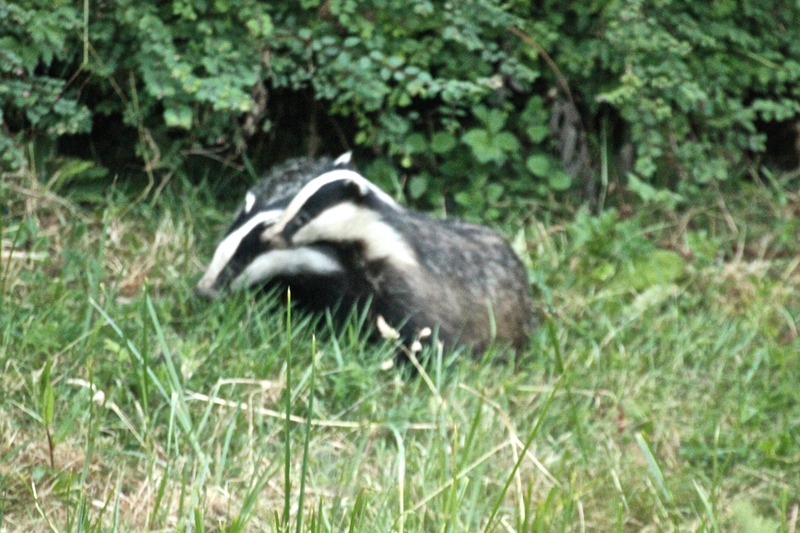 They ‘sing’ by rubbing their legs against their wings and they have ears in their bottoms! 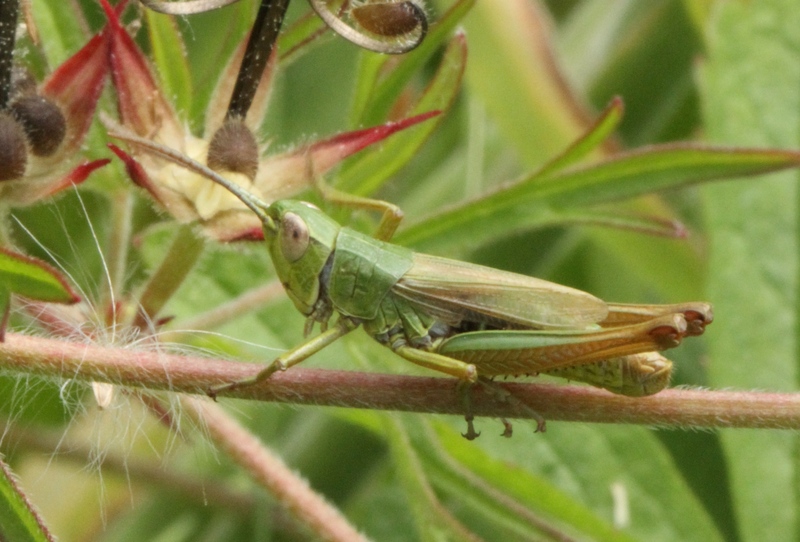 The Meadow Grasshopper can be green, brown or, rarely, vivid pink! 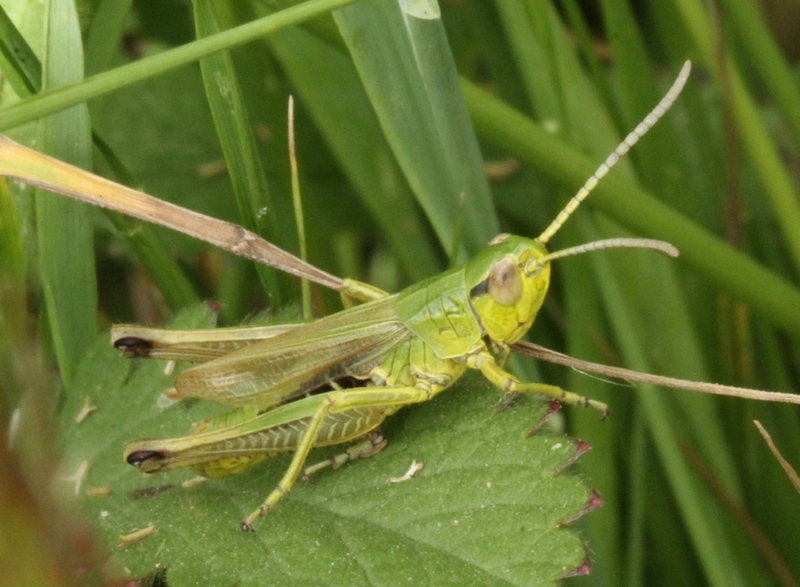 Their wings are much shorter than their legs, and they are the only UK Grasshopper that can only hop, not hop and fly. Conditions: Cloudy and wet up north. Temperature: Max 14- Min 10 C.
A Labyrinth Spider’s web in tall grasses- the little yellow dashes are grass seeds caught in the web!). 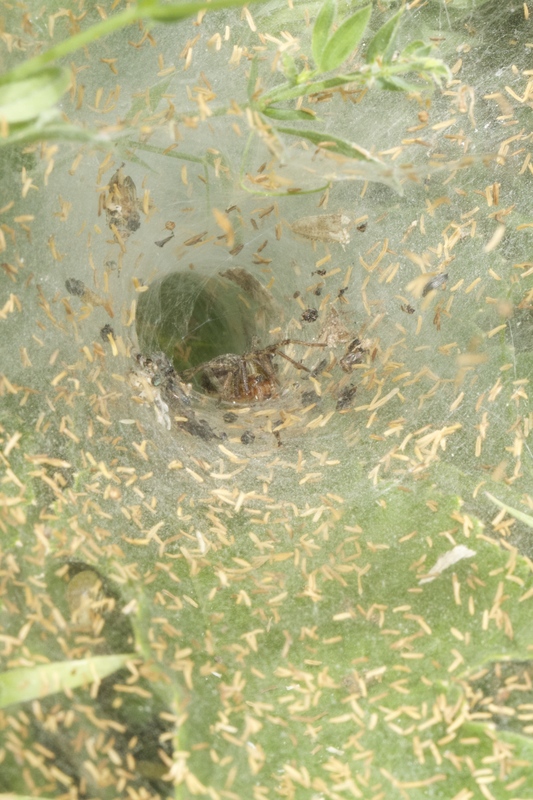 The adult Labyrinth spider is lurking at the top of the funnel of its web! An indistinct view of the Labyrinth Spider, seen at the start of the Labyrinth. 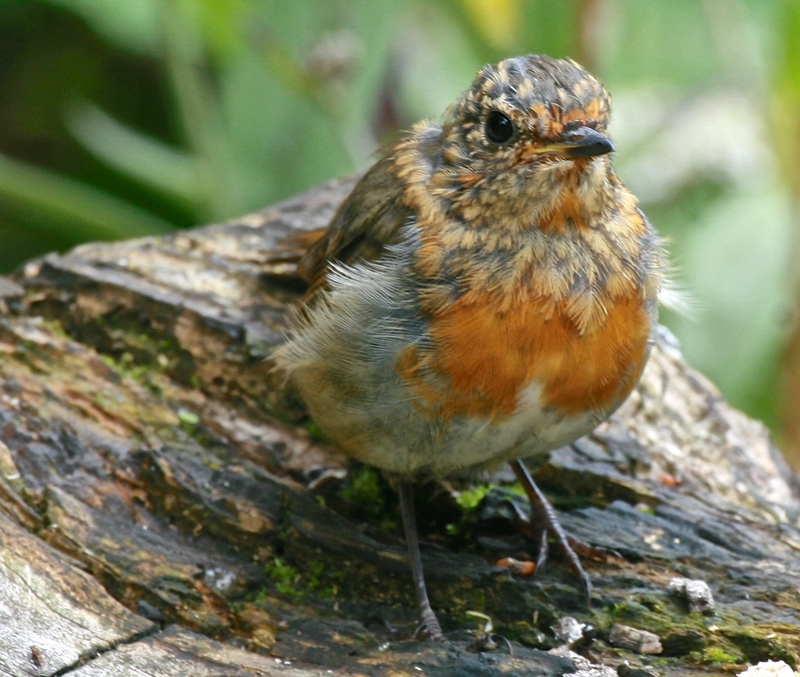 Young Robin in the garden, just beginning to gain it’s red breast. 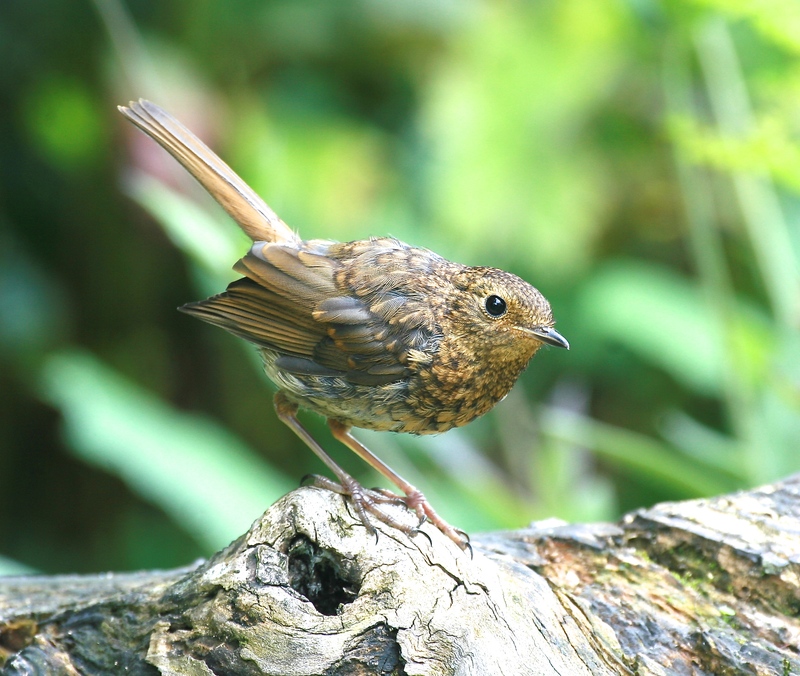 The red breast of the young Robin becoming more prominent. 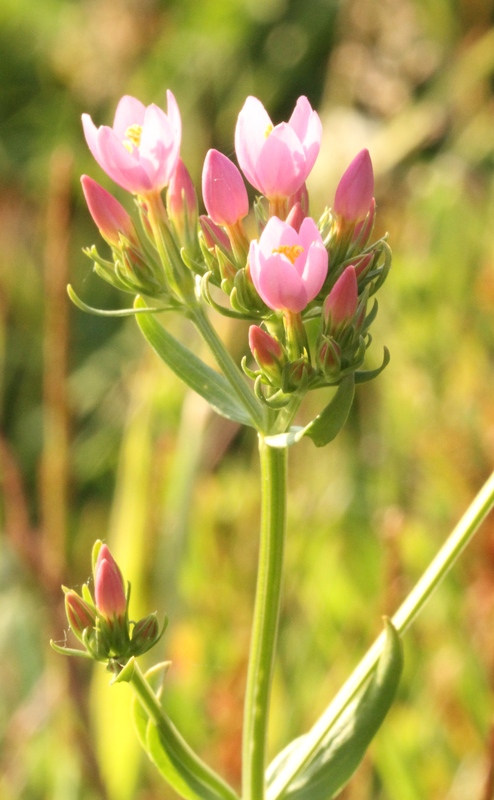 Centaury flowers- closing in the afternoon. 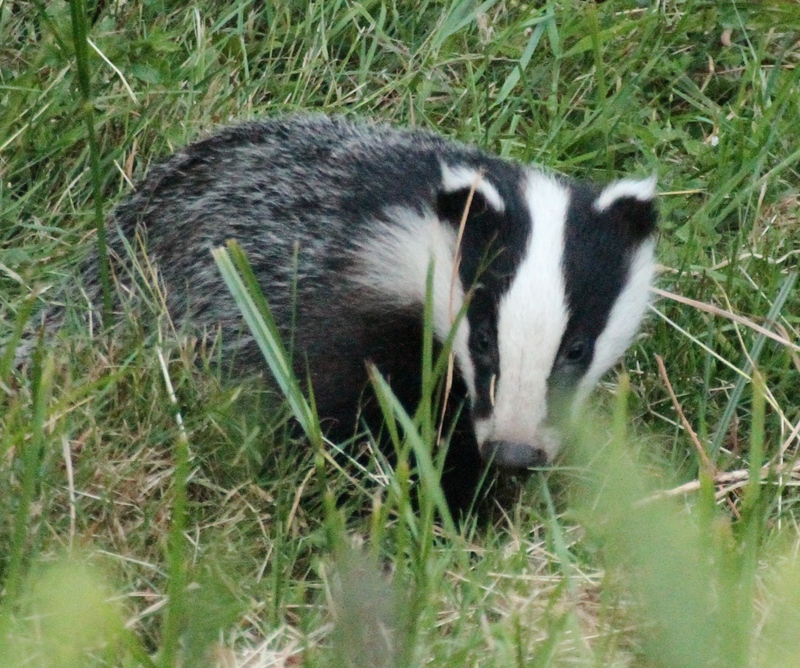 Badger out about 9 p.m. last night, with another lurking in the bushes!